As Democrats continue to vote for women in record numbers this midterm cycle, a new poll from NBC News and The Wall Street Journal shows just how pronounced the party’s enthusiasm for female candidates is in 2018. Among registered voters of all political stripes, two-thirds (67 percent) say that the country would be better off if more women were elected to political office, while just a quarter of voters (24 percent) disagree. But it’s among Democrats that the pro-female candidate sentiment is most overwhelming. Nearly nine-in-10 Democrats (87 percent) say the country would be better off with more women in office, while 10 percent disagree. 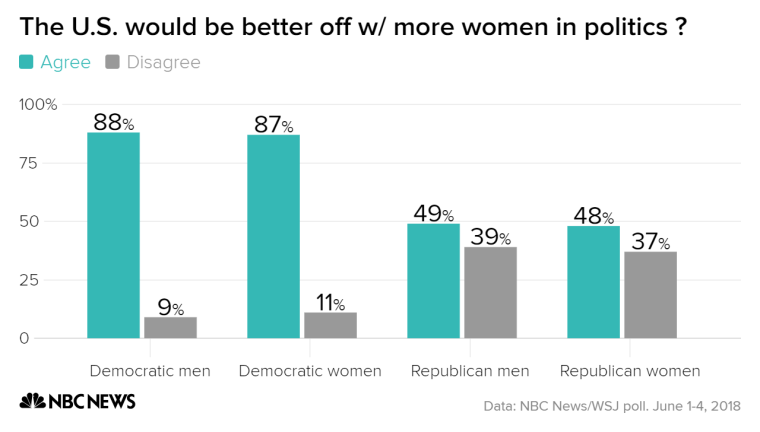 Yet among Republicans, just 49 percent say the country would be better off with more women in office, while 38 percent say they disagree with that statement. Partisanship, not gender, is in fact the most defining factor in voters’ views of women’s influence on American politics. About the same share of men overall (66 percent) and women overall (69 percent) agree that the country would be better off with more female elected officials. Female voters do express slightly more enthusiasm for candidates who are women. About a third of women (31 percent) say they would be especially enthusiastic about a candidate who is female, compared with 17 percent of men who say the same. 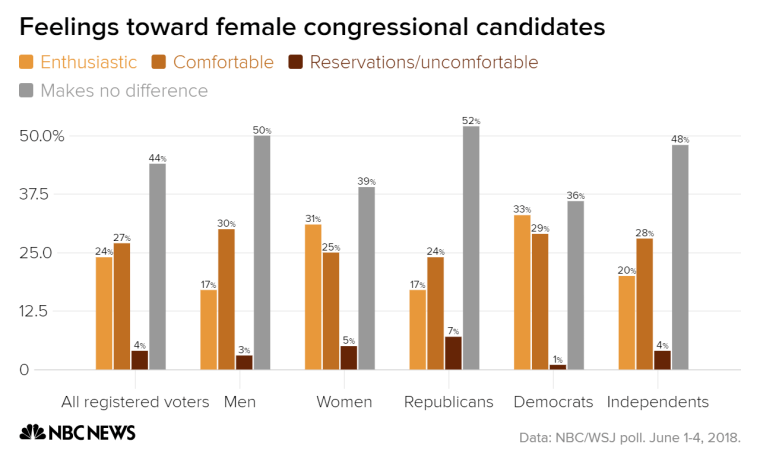 An additional 25 percent of women and 30 percent of men say they would be “comfortable” with a female candidate, with nearly all of the rest of voters saying that a candidate’s gender “makes no difference.” Just 4 percent of voters overall say they would be uncomfortable or have reservations about a woman running for Congress. The particularly intense Democratic enthusiasm for female candidates has been reflected both in the surge of women running for office this cycle and in their success in primaries to date. So far this cycle, a total of 431 women — including 320 Democrats — have filed to run for the House, smashing the previous record of 298 female candidates in 2012, according to the Center for American Women and Politics at Rutgers University. And with months left to go in primary season, at least 116 women — 94 of them Democrats — are already set to be their party’s House nominee. One of the only biographical details more desirable for both Republicans and Democrats? Military service. About seven-in-10 voters overall (71 percent) describe those who are veterans as particularly attractive political candidates. The enthusiasm for female and veteran candidates has also been underscored this midterm cycle by significant primary victories for women with military backgrounds, particularly among Democrats. Former U.S. Air Force captain Chrissy Houlahan (Pa.-6), Marine fighter pilot Amy McGrath (Ky.-6) and Navy veteran Mikie Sherrill (N.J.-11) are all considered among to be among the Democratic Party’s strongest congressional candidates, and each will each compete in must-watch races in the fall. On the GOP side, Republicans in Washington hope that onetime combat fighter pilot Martha McSally will emerge from her August primary as the strongest candidate to retain Jeff Flake’s Arizona Senate seat. While the NBC/WSJ poll shows good news for Democratic women and female candidates generally, the two most high-profile women in the Democratic Party — Nancy Pelosi and Hillary Clinton — do not fare nearly as well. Just 21 percent of voters said they’d be more likely to back a candidate who promised to support Pelosi as House Speaker if Democrats win back the chamber, while nearly half — 45 percent — said they would be less likely to vote for that candidate. And asked if Hillary Clinton’s endorsement sway their vote, just a quarter said they would be enthusiastic (9 percent) or comfortable (14 percent) with a candidate backed by the former presidential contender, while nearly half said they would have reservations (12 percent) or be uncomfortable (37 percent) based on her support. The live-caller NBC/WSJ poll was conducted June 1-4 among 900 registered voters — about half contacted via cellphone — and the overall margin of error in the poll is plus-minus 3.3 percentage points.